It’s always exciting to get a new place to live! You can own it or rent it, but the feeling is still the same ~ you want to make it your own, and have it reflect who you are and what’s comfortable and inviting to you. Even if you’ve been fully furnished and accessorized in a previous home, there are inevitable changes that will occur because of the new space. I’ve worked with a few clients already this year that have purchased new homes, and here’s some of the suggestions I’ve given them. Furniture Placement ~ You have a completely new floor plan to work with, and some furnishings may need to be removed because they don’t work well in the new layout, or additional pieces may need to be purchased. A piece that was previously in your living room, may now find its way to the dining room instead. Try and keep an open mind about where you place your furniture, and don’t get locked into fixed ideas about a particular piece needing to be in a particular room. 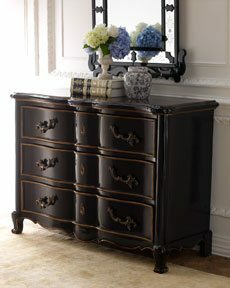 This beautiful chest from Horchow.com can work equally as well in a dining room, living room, bedroom, or even a foyer. This is really an area where you can think outside the box. Play With Color ~ The best way to add character and warmth to your rooms is with color on the walls, yet this is an area that I see many clients struggle with. It doesn’t have to be dramatic to produce a big impact, so even soft tones will have a wonderful effect. If you know your color scheme and are ready to paint, get it done before you move in, if at all possible. If you’ve hired professional painters, they’ll love you for this! Take Your Time ~ It’s only natural to want to have your home fully furnished and accessorized, post-haste! That said, if you truly want your home to reflect you, then try and let it evolve over time. It’s tempting to run out to your favorite retailer and create the room you love straight from the catalog, but does that really express your unique character? Go ahead and get the basics, but save some room for art, accessories, or furniture pieces that you’ll find along the way in life’s journey. The end result will be one-of-a-kind! If I can give you any assistance with your design or decorating needs, please don’t hesitate to call or email me. Many times a single consultation is all that’s needed to pull your ideas together! what to do in/with your home can be so intimidating it stops most people from ever doing anything. You give great, easy to understand, and easy to impliment ideas for turning a house into a home that reflects you! great ideas Kathy! This is sometimes a difficult subject to broach with my clients who want the new home to fit the furniture. Thank you for so eloquently pointing out the things that I say all of the time to my clients–the furnishings need to fit the home, not the other way around. You are so correct in that furnishing a home can take a while. Working with a wonderful designer like you makes it a much less painful process! Great post! Thank you so much for the input, Dawn, and my apologies for not realizing your comment was here! 🙂 I love working with new homeowners, and fabulous realtors like you! This was so timely as I just had some work done in our home, we also had the “popcorn” taken off the ceiling and the room painted a misty blue. The furniture is the same, however playing with it for a while I found an entirely new way to arrange it. Your article on how to make the furniture work was wonderful and gave me the idea to work with what I had…and I am so thrilled. Thank you! Kathy, sounds like really great planning advice. Stepping back and thinking about a new splash of color sounds like a quick, easy and inexpensive way to make a dramatic change to a place.